Our new survey of local public media newsrooms finds a solid commitment to daily coverage, a broad effort to provide depth coverage, and rather sporadic levels of deep engagement and intensive production. 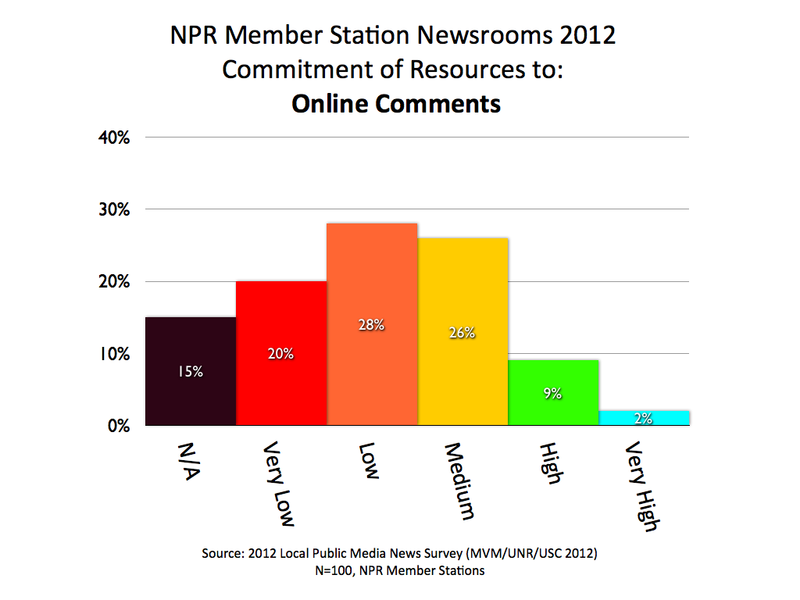 Two years ago, we took a look at what local NPR stations were calling local news on their airwaves. While we modified the survey and the analysis somewhat, in general the picture looks quite similar. 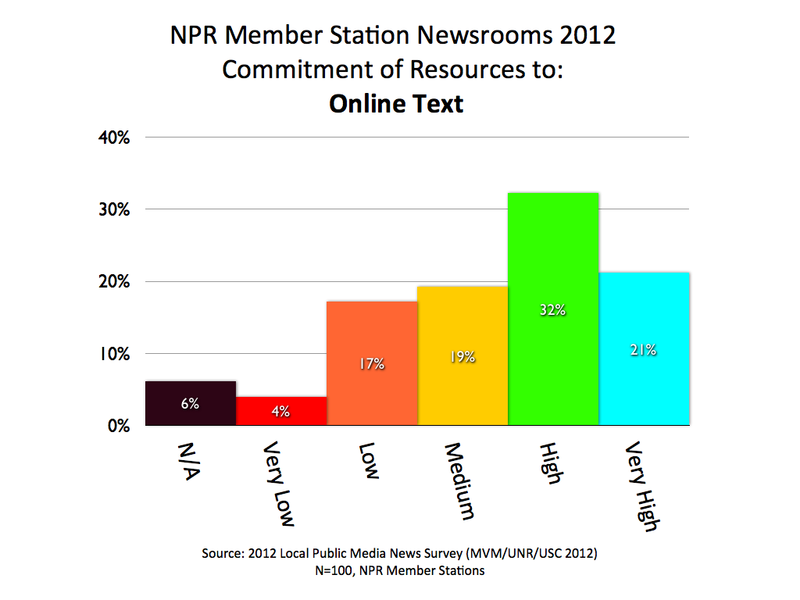 Here is the stack of local news program types we asked about in the 2012 Survey of Stations (MVM/UNR/USC 2012) — ranked by their mean score. The higher the score, the more prevalent the commitment of resources to this programming type. This hierarchy of commitments ranks about the same as it did in 2010 — though, as mentioned, the methodology changed to cover more program types and to give us a more refined look. Here are the charts for each program type. 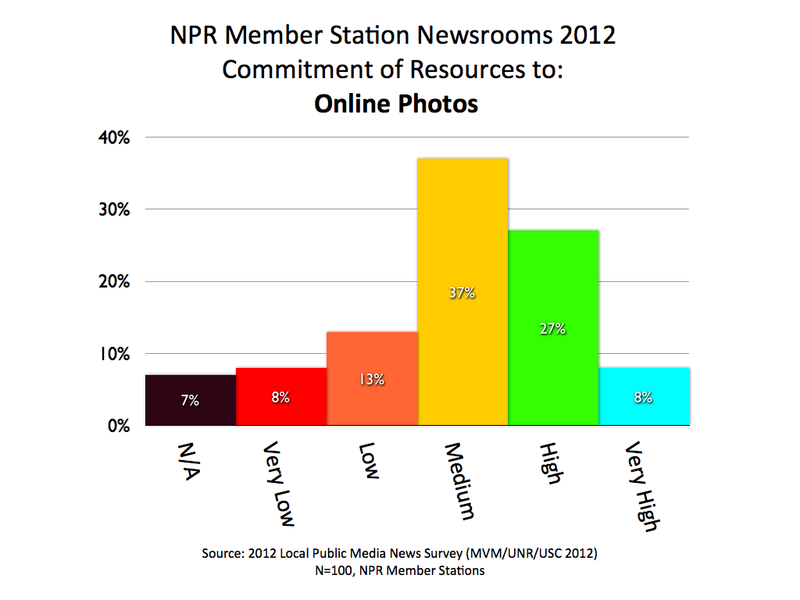 Interviews are such a key element of original news gathering, it’s great to see they rank highest among all NPR stations as a local news staple. Most stations are heavily vested in newscasts as the vehicle for their local news. The 3-5 minute feature is a fundamental unit of news in public radio, which devotes more time to issue coverage. 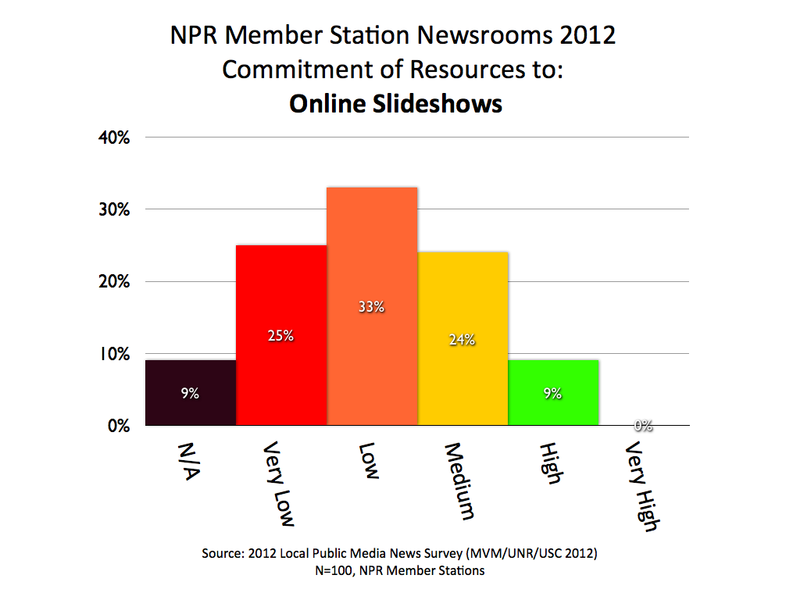 Over half the NPR stations have a high or very high commitment to feature reporting. 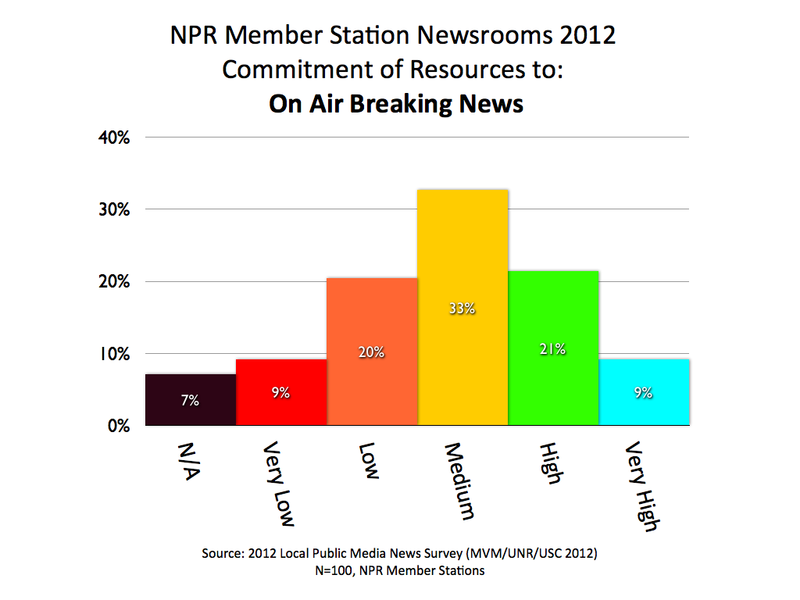 Breaking news coverage ranks a lot higher than one might guess, given the emphasis on depth coverage on NPR stations. Yet, these radio stations are assuming a larger role in the daily coverage of their communities and that requires some willingness to get on top of breaking news. Beat reporting is a sign of a depth and commitment to original journalism. This is less of a program type than it is an organizational approach to news, but it is fundamental to how news is gathered, packaged and presented. 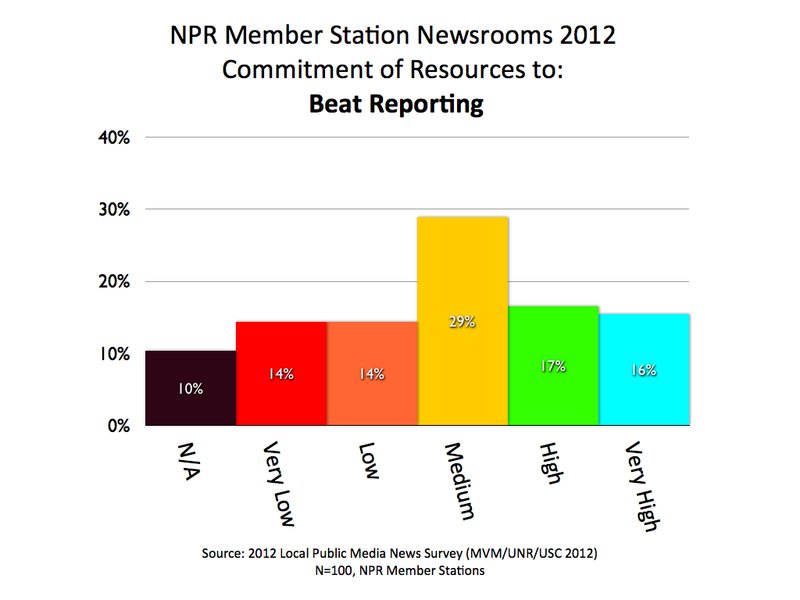 Since beats generally require larger newsrooms, there’s a divide in the data. Another sign of healthy commitment to depth of coverage is the “news series,” where a topic is too big to be covered in one report, so it is managed in multiple installments. A quarter of stations have a high or very high commitment to series. 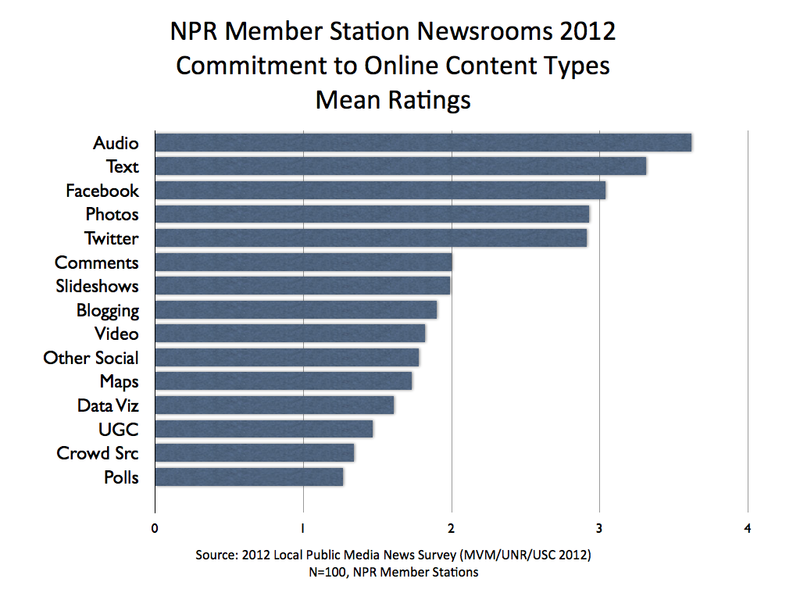 Local stations serve their communities well when they can tailor content to meet local needs. This category shows a rather healthy commitment to specialty programs — whether they be segments on arts, health, business, etc. Sometimes these elements are more attractive to sponsors, which may help fuel wider adoption. These on-air calendar of events used to be a larger staple of public radio. Websites are better at delivering that kind of information. However, many small stations still provide them. 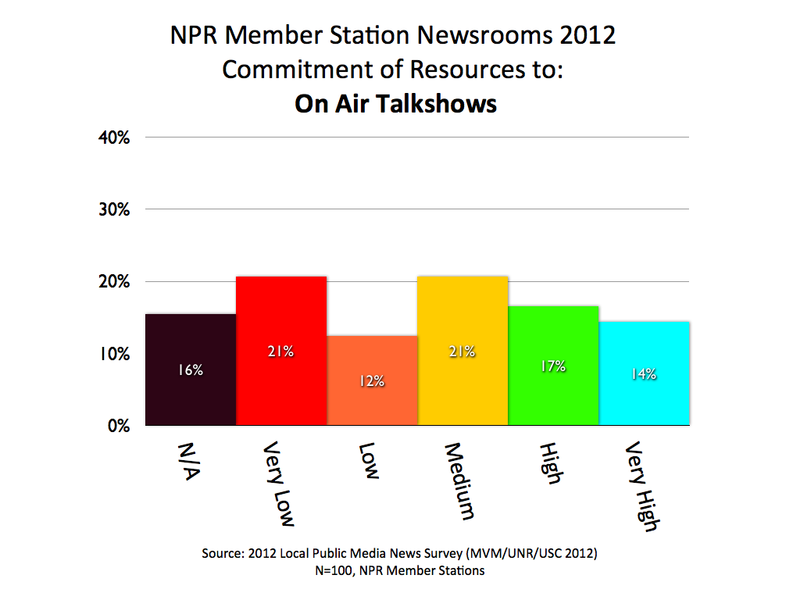 This chart is rather flat indicating that talk shows are not uniformly popular in public radio. But they rank as high or very high commitments from almost a third of stations. In general, talk shows indicate a station’s larger staffing commitment to local news and public affairs. 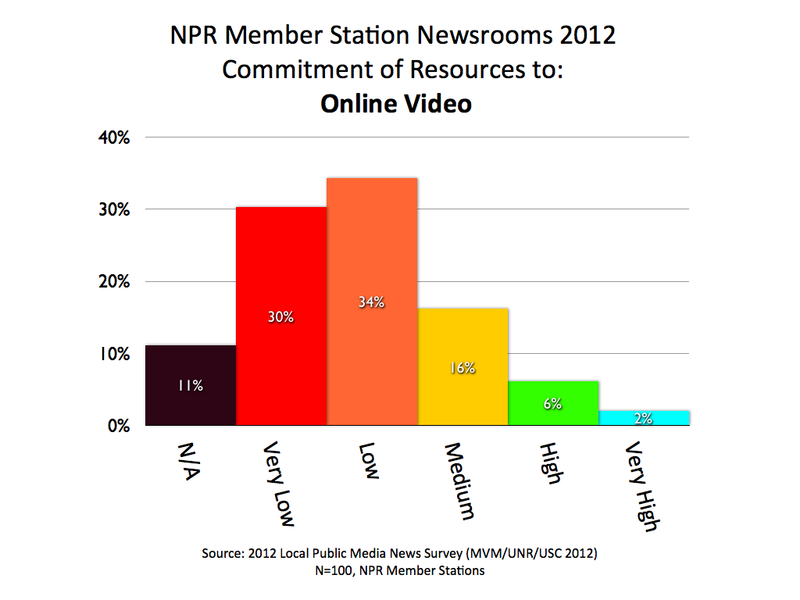 This chart shows a low commitment to this kind of local news programming. The news special is typically a timely, one-off, intensively produced program. News stations don’t need to resort to news specials if they are doing a good job of daily coverage, feature coverage, series coverage, beat coverage, etc. Public Service Announcements aren’t news but they fulfill a local community service commitment, and sometimes they are handled by newsrooms. 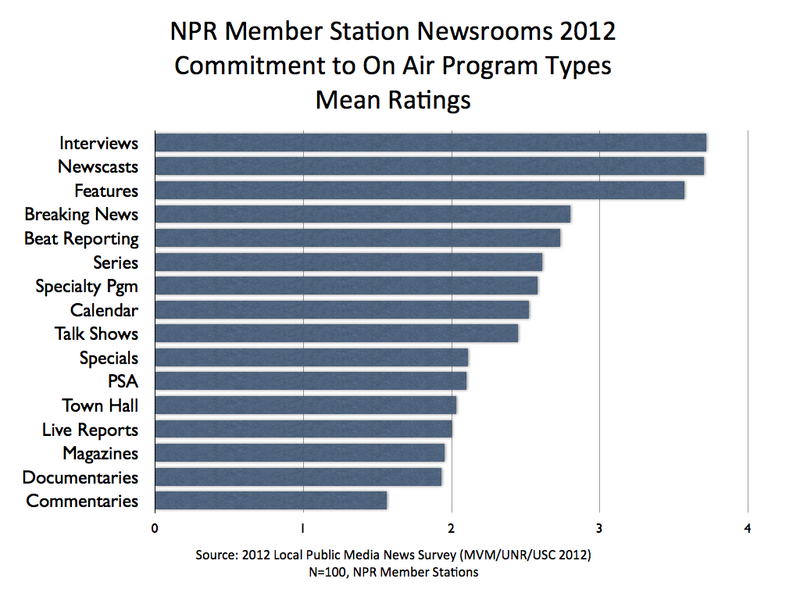 More than half of stations have little or no commitment to them. In an age of social media, the town hall meeting is more anachronistic than ever. 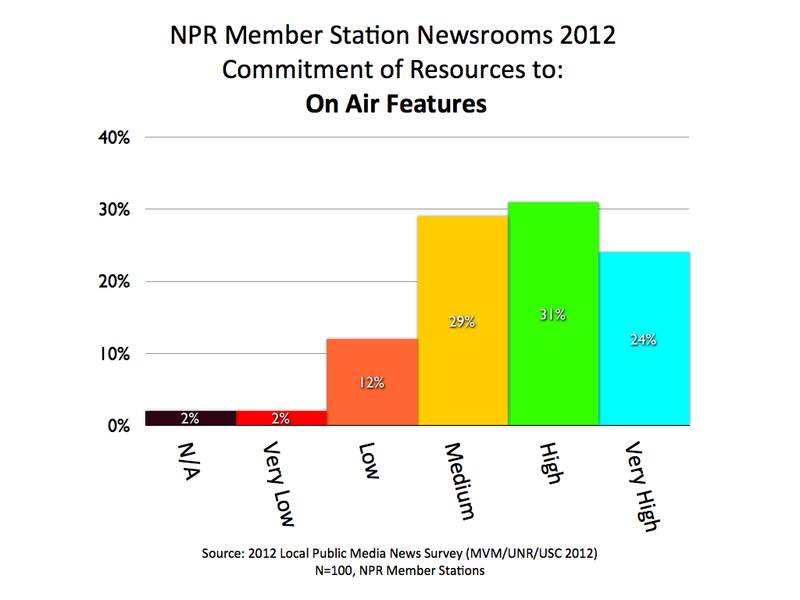 Seventy percent of NPR member stations make little or no commitment to hosting or airing them. 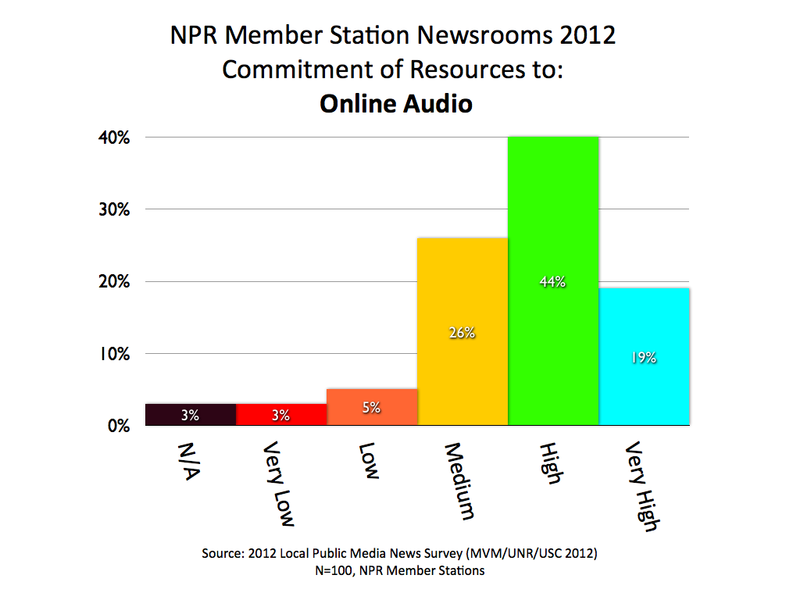 Radio is a medium for immediacy, but two-thirds of local NPR stations are hardly committed to this form of news coverage. Most stations don’t produce on-air news magazines, which tend to be labor intensive. 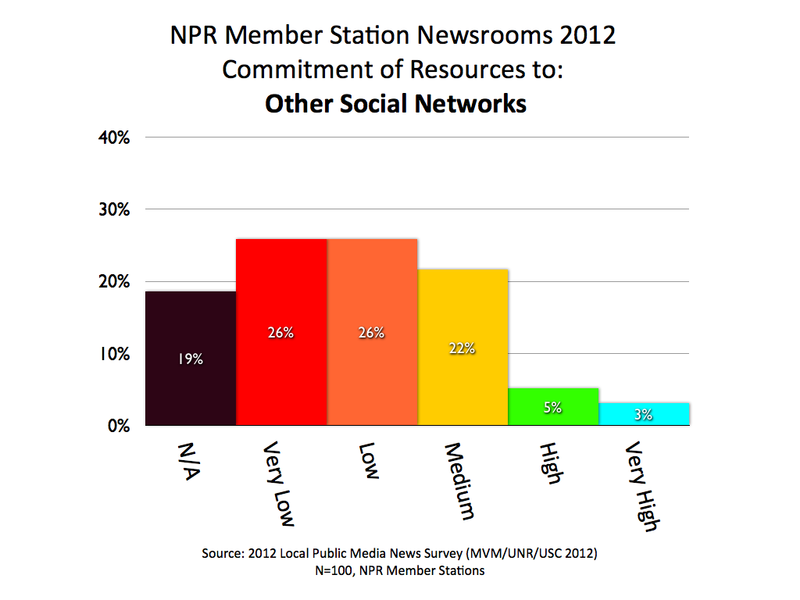 Yet, a fourth of stations do have the resources or commitment to produce them. The local radio news documentary has been a fading form for years. 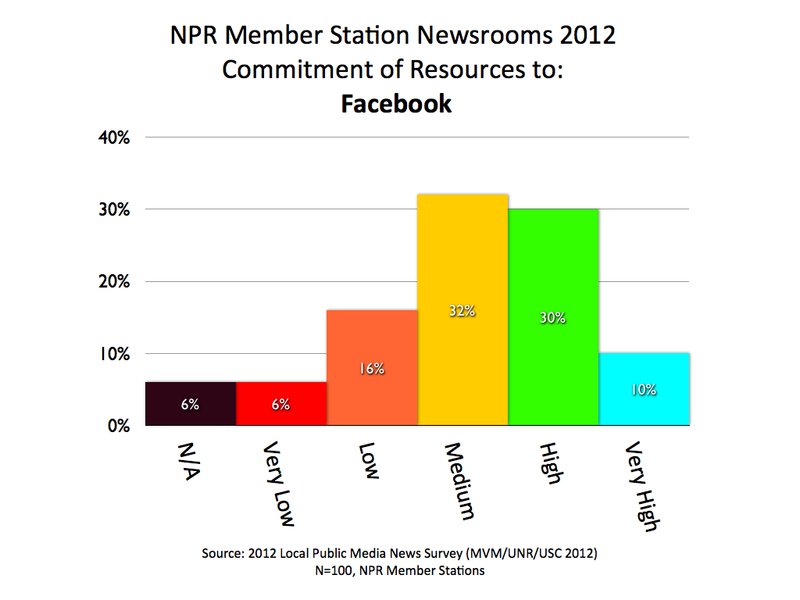 The most remarkable thing in this chart is that some 12% of stations are committed to them. Radio commentaries give opinion leaders access to the airwaves to provide perspective on the news. This was the least popular form of local news programming found in the survey. As the chorus calling on public media to add more local journalists grows, let’s be mindful of the specific ways adding journalists can dramatically improve local public service. Just by enlarging its newsroom to four, five or six journalists, a station will gain the human wherewithal to unleash a proper beat system. Beats cause reporters to become specialists. With a news staff of six, for example, a newsroom could have reporters well versed in the actors, history and nuances of a starter set of beats — education, health, business, law, environment and arts/culture. Pubradio newsrooms cluster in six weight classes based on staffing, i.e., Welterweights such as Georgia Public Broadcasting (above). These specialists are more likely to break original stories, to know when it’s important to follow up, and to extract meaningful news analysis from a week’s events. Shifting to a beat system is a quantum leap in editorial power, but that’s just one of the thresholds in staffing at which a newsroom begins to realize strategic benefits. Even adding a single journalist can bring disproportionately powerful results. 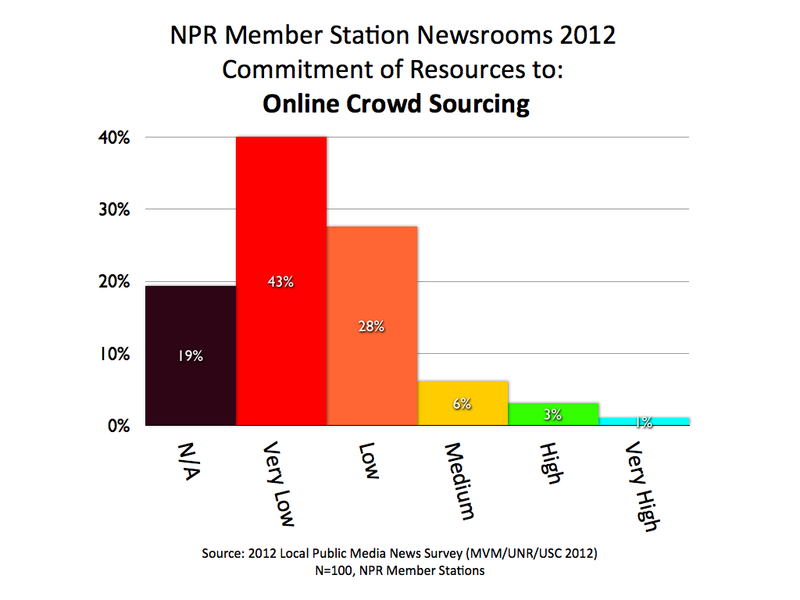 More than half of all NPR member stations have three or fewer full-time journalists — in some cases because the station’s major interest is music, or it simply lacks the budget to hire more. Even so, adding one or two newsgatherers can make the difference between rip-and-read headlines and original reporting, gaining the ability to cover two important events at the same time, or having a spare set of eyes to edit reports before they’re broadcast. 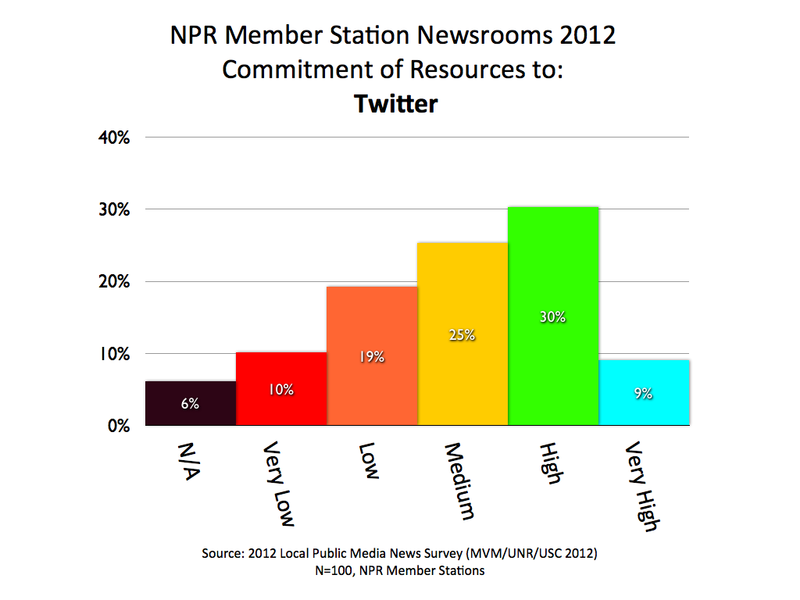 Larger newsrooms achieve greater levels of actualization. Those big enough to staff a daily talk show are a case in point. The shows expand local service in a new dimension by giving people a virtual place to gather, discuss their views and have their questions answered. 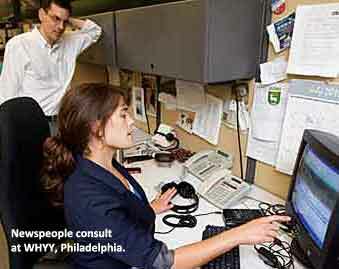 The shows can spotlight in-house reporters as experts. A local host can quickly propagate a large social-media base. And the shows can transform stations — making headlines via interviews, introducing more live production capacity and enabling the core competencies needed during crisis coverage. While it’s true that some stations have talk shows sans newsrooms, having both packs the greatest wallop. One of the difficulties inherent in compressing a newsroom into a few people is getting them to perform multiple roles effectively. Tandem jobs are very common: host/reporter, manager/producer, anchor/editor, and so on. A survey I managed for Public Radio News Directors Inc. in 2010 showed that two-thirds of full-time journalists in public media divided their jobs between a primary role and a substantially different second role. 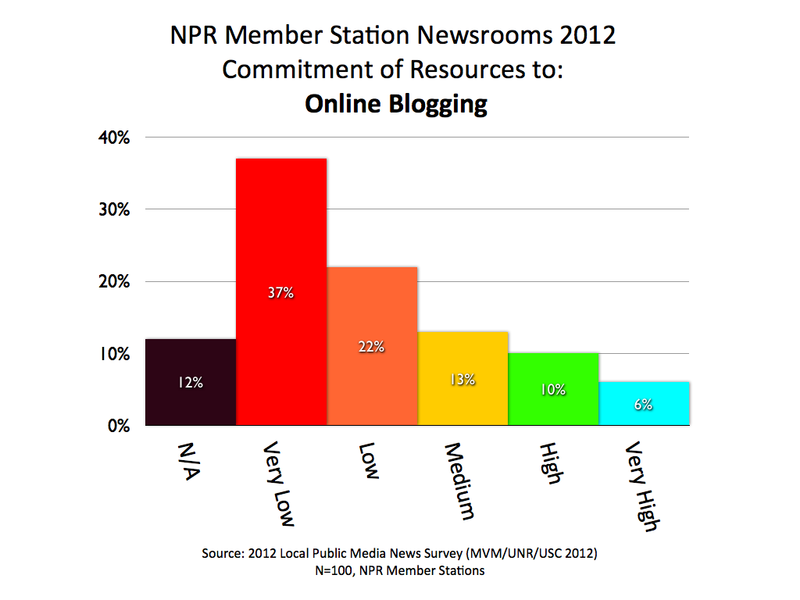 Yet, among the largest NPR station newsrooms, 95 percent of full-time staffers stick to their primary role. It appears that the advanced stages of newsroom evolution feature full-time hires doing full-time jobs. Public media could benefit from a closer look at the inner workings of local newsrooms. There’s plenty of research on audience perceptions of local news — belaboring the point that NPR listeners don’t tolerate weak local news — but not so much research on the resources and other advantages that undergird strong local news. To probe those factors, I undertook some analysis while working at Stanford University during a 2011 Knight Journalism Fellowship. I unpacked the results of a detailed survey of local public media newsrooms that I conducted in 2010 for PRNDI with help from consultants Steve Martin and Ken Mills. The responses of 378 local managers, program directors and news directors provided data on some 75 factors in their news staffing, spending, programming, technological innovation, partnerships, licensees and other particulars. Not surprisingly, the findings show that staff size is a major factor in newsroom capability: Bigger equals more and better. Moreover, we see that like-sized newsrooms exhibit like levels of news proficiency at observable stages, climbing predictably toward higher performance goals. It should be noted that size is not everything. The individuals doing the journalism — their training, skills and hustle — can make a newsroom shine out of proportion to its resources. So can the station leadership, deployment of partnerships or smart uses of new technologies. So, based on my research — and borrowing weight classes from the world of boxing — here’s a handy typology that describes newsroom traits found in 2010 at different staffing levels. 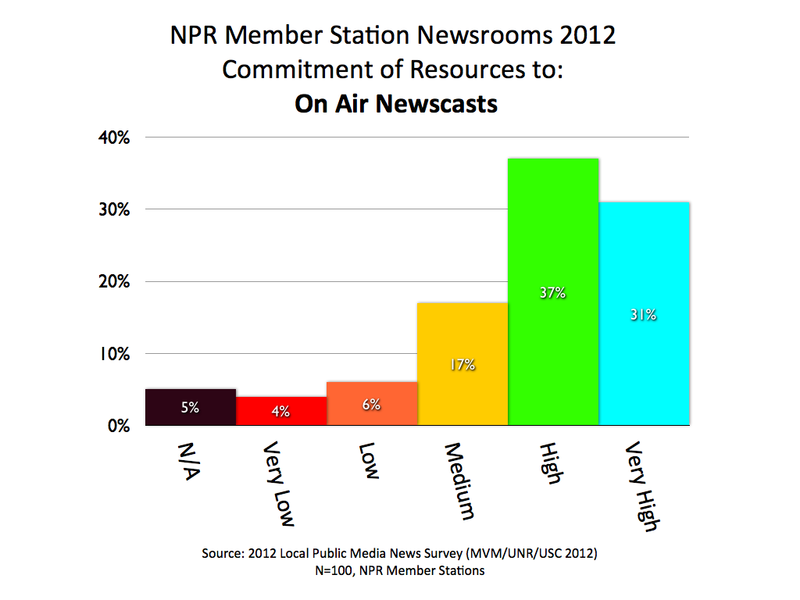 Some 60 NPR stations barely tip the scales with one or fewer full-time news person. You might expect to find these mini-fighters only in rural communities, but that’s not the case. While half of them serve populations under 250,000 (market size 180 and higher) — such as WVPE in Elkhart, Ind. — the other half are sprinkled in markets 50–180 — such as KTEP in El Paso, Texas. 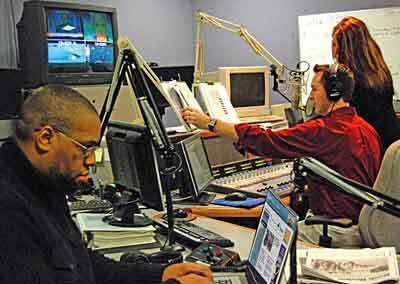 And a few are based in sizable communities such as KVCR in San Bernardino, Calif., and WWNO in New Orleans. Many are oriented more to music than to news. Typical among these little bruisers are WRKF in Baton Rouge, La. ; KCHO in Chico, Calif.; and WXPR in Rhinelander, Wis. The skinnier half have news budgets under $50,000 a year and produce less than three hours a week of local news content. The other half have budgets between $50,000 and $250,000 and crank out a surprising four to six hours per week of local news and public affairs. They get most of their news cred through national offerings of NPR, PRI and American Public Media. Locally, they do a lot with a little. They use state-network feeds extensively and adapt wire copy to flesh out newscasts (if they can afford the wire service). The fancy footwork of the lone full-time journalist can make or break the news operation. Lately the one-man bands winning the most awards have been Lance Orozco of KCLU in Thousand Oaks, Calif. and (the just retired) Mary K. Mitchell at WUGA in Athens, Ga. Scouting reports give gold stars for online innovation to KWBU in Waco, Texas, and WGTE in Toledo, Ohio, which report occasional use of Facebook, Twitter, maps and online audio and video. Meanwhile, in the area of news partnerships, the standouts include WHQR in Wilmington, N.C., which works well with NPR and with local TV and a newspaper. This weight class is the largest contingent of NPR-member-station newsrooms: 80 of them. Having twice or thrice the muscle mass of the Featherweights, these guys occasionally land solid blows in news coverage. Mostly, their added resources allow for the advantages of teamwork: more consistency, more range, less burnout, more institutional memory, and the all-important story editing. Their bread and butter are the quick jabs during the local breaks of Morning Edition and All Things Considered (these stations more often than the Featherweights have news formats). Some shops try daily spot coverage, while others try polished feature production. (To do both spots and features consistently is very difficult in this fighter class.) A smattering of stations go in the direction of longer talk programming. Geographically, this cohort is distributed widely — from rural Alaska (KCAW in Sitka) to mid-size cities (WKNO in Memphis, Tenn.) and an occasional major metro (WFUV in New York) — but the vast majority of these shops are outside the top-30 markets. In terms of news spending, Lightweights tend to have annual news budgets between $50,000 and $250,000, though a dozen spend less and a half dozen spend more. What do these newsrooms produce? I found three clusters of output: The largest group concentrates on newscasts and features, airing 1–3 hours of local news a week (WFYI in Indianapolis, KAWC in Yuma, Ariz.). About one-third air 4–6 hours of local news a week, indicating either a fuller slate of newscasts, longer local segments or a smattering of regularly scheduled news programs (KUAR in Little Rock, Ark. ; KWSO in Warm Springs, Ore.). The remainder report airing more than seven hours per week of local news and public affairs, which, in most cases, involves a daily news program (KFSK in Petersburg, Alaska; KTOO in Juneau, Alaska; KPCW in Park City, Utah). As in the Featherweight class, individual hires make a huge difference, even though they must excel at multiple roles — hosting and reporting, reporting and editing, producing and reporting. Thus the available hours for original reporting are fewer than appears. Choices must be made. Those that air local talk shows, for example, are devoting resources to hosting and producing — not actual reporting. Some perennial award-winners in this weight class include WBHM in Birmingham, Ala.; KLCC in Eugene, Ore; WBGO in Newark, N.J.; and WBFO in Buffalo, N.Y. I’d also highlight KDNK in Carbondale, Ill.; KOCV in Odessa, Texas; and WCVE in Richmond, Va., for all-around effort. 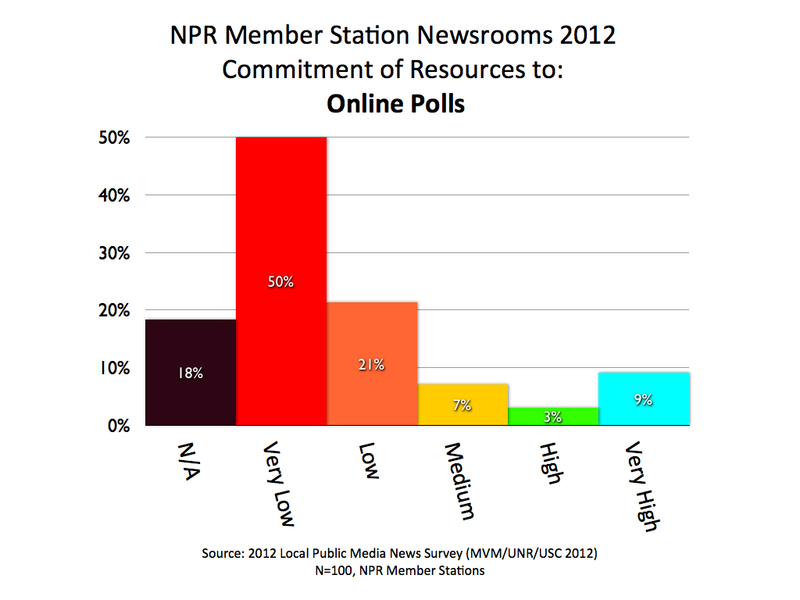 Some 63 NPR-member news stations make up this solid core of public radio news. They generally pack a bigger punch when it comes to original reporting because they are more likely to establish beats, routinely monitor governmental affairs and afford the extra time it takes to produce in-depth, high-quality packages. These stations are devoted to the “get an edit” philosophy but generally aren’t large enough to install full-time editors. These are predominantly university stations in medium and large markets. 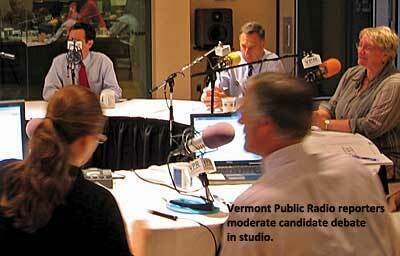 The remote areas include WRVO in Oswego, N.Y., and Colorado’s Aspen Public Radio. The more populated locales include KPLU in Seattle and WUSF in Tampa, Fla. In between are places like WVXU in Cincinnati and KCUR in Kansas City, Mo. They also include some statewide services — Wyoming, Hawaii, Nebraska, South Carolina, Mississippi and Georgia. As newsrooms beef up, these are the first we see with even a handful of news budgets greater than $1 million. The median is around half a million. A dozen operate on less than $250,000 a year. Like Lightweights, they largely strive to supplement national news offerings, but they have the poundage to generate more spots in local news breaks, more features, more special reports, more online work and more news series — with more polish. About a fourth of news departments in this class produce up to 30 minutes a day of local news content (Monday through Saturday) — typically concentrating on drivetime cutaways. The more-developed newsrooms in this class (about a third) average up to 60 minutes a day, meaning longer segments and/or more newscasts. And then there are a few that produce daily news programs, such as St. Louis Public Radio, KUER in Salt Lake City and WGCU in Fort Myers, Fla.
At this level of sophistication, online news is still markedly secondary to broadcast, though we more often find more consistent web news offerings, including audio, some photos and maps, and frequent use on Facebook and Twitter to engage with listeners and potential sources. Aside from those mentioned above, some notable newsrooms in this class include WABE in Atlanta; WSHU in Fairfield, Conn.; KBSU in Boise, Idaho; Kansas Public Radio in Lawrence; WILL in Champagne, Ill.; and WNED in Buffalo, N.Y. For online advances, I’d recommend merit points for broad-area broadcasters North Country Public Radio in Canton, N.Y., and High Plains Public Radio in Garden City, Kan., with a special salute to KMXT in Kodiak, Alaska, just for being in this weight class. These 28 newsrooms are ready to go the distance and more likely to score occasional news knockouts with investigative reporting or major news projects. Many of these stations have climbed the news ladder by dedicating themselves to all-news formats and producing daily talk shows or newsmagazines. (The rare exception that does neither: KUT in Austin, Texas.) The potent combo of a beat-oriented newsroom and a daily program delivers a one-two punch, knocking some sense into news reports and then letting people bat them around in civic conversation. Most Middleweights are in metro areas, serving populations of a million or more. Their budgets run from $550,000 to above $1 million. More than one-quarter of them spend over a million. At this level — perhaps to achieve this level — the radio and TV divisions of joint licensees find ways to mingle resources. 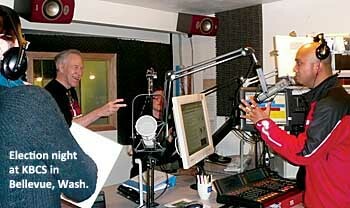 Stations such as WXXI in Rochester, N.Y.; WOSU in Columbus, Ohio; and KUAZ in Tucson, Ariz., take different approaches. With Middleweights’ greater staff capacity, we now encounter full-time managers, editors and online specialists — jobs considered luxuries in smaller newsrooms. In fact, half of the full-time journalists at these stations are assigned to a single task such as reporting, up from 25 percent among Welterweights. The Northeast all-stars congregate in this group: WNPR in Hartford, Conn.; WRNI in Providence, R.I.; the Vermont, New Hampshire and Maine networks; and WAMC in Albany, N.Y. Other Middleweights of note include Capital Public Radio in Sacramento, Calif.; WFPL in Louisville, Ky.; Michigan Radio in Ann Arbor; WUWM in Milwaukee; and the Colorado, North Carolina and Iowa networks. Some growing newsrooms may bump up to the next weight class if they haven’t already: KJZZ in Phoenix, WLRN in Miami, and KERA in Dallas. Only nine news stations in the 2010 survey boasted staff sizes between 20 and 30 full-time journalists, all in top-20 markets with news budgets between $1 million and $5 million. They produce more than an hour of local news and public affairs daily, on average — in some cases, three hours a day. As in Abraham Maslow’s theory about self-actualized people, these stations have moved beyond worries about their basic journalistic needs. They have beats, do the talk shows, and have an advanced layer of leadership and quality assurance. They can attend to higher levels of news performance, such as pursuing long-range or investigative news projects, or moving strongly into multiplatform news distribution. The joint-licensee standouts include KPBS in San Diego, Oregon Public Broadcasting and WCPN in Cleveland — all managing to cross-collaborate on radio, television and online. The radio standouts include WAMU in Washington, D.C.; KUOW in Seattle; and Wisconsin Public Radio — a state network with multiple audio services. The heaviest hitters throw knockout hooks left and right. These seven most-evolved station newsrooms employ 30 to 60 full-time news people, who are seldom required to wear many hats. Almost 95 percent of them spend at least 30 hours a week in their primary roles. They’re in the biggest markets — WNYC in New York, KPCC in Los Angeles and WBEZ in Chicago. They include two joint licensees — KQED in San Francisco and WHYY in Philadelphia. The smallest newsroom of this lot (the Rocky Balboa?) is WBUR in Boston — certainly no pushover. The largest of the lot is a statewide network: Minnesota Public Radio in St Paul. These are all exceptional performers in ratings, fundraising and journalism. 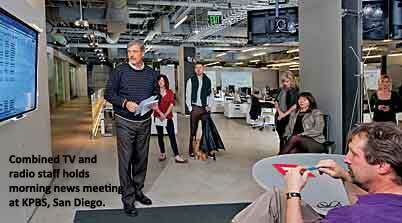 Their news budgets exceed $2.5 million a year. All produce in excess of three hours a day of news and public affairs. These stations are known nationally — partly because they make and distribute many national programs (Fresh Air, On Point, This American Life, On the Media, The Takeaway and more). They not only have depth in reporting and are advanced in sparking community conversations, but all are leaders in defining the future of public media. These innovation centers rapidly engage new audiences on digital platforms and experiment in partnerships. In this corner: 1,000 new journalists! This correlation between larger news staffs and greater public service lends hope and credence to leaders in public radio and in journalism who are calling for larger newsgathering ambitions. They argue that mission-driven journalism needs to step in where the commercial model fails. Among the voices are the Knight Commission, the FCC, CPB, Barbara Cochran, Steve Coll, Michael Schudson and Leonard Downie. And then there’s the visionary Bill Kling, founder of Minnesota Public Radio and American Public Media, who has suggested the goal of adding 1,000 journalists to local public radio newsrooms. That would be a 40 percent increase on top of the 1,500 full-time journalists working in CPB-assisted public radio and radio/TV licensees. The ambitious proposal begs some questions. Not only, where would that new money come from, but where would it best be spent? Those are for others to answer, but as we see from this set of newsroom weight classes, big gains in local news could be achieved with wide distribution of the added journalists because of the disproportionately large service improvements that result from modest growth in smaller newsrooms. For example, it would take far less than a thousand journalists to push all NPR-member stations in the top 50 markets up to the Cruiserweight. And in markets 50 to 360, it would take roughly 500 journalists to grow all of the stations to Middleweight. Thomas and Clifford are careful to mesh staffing goals with a movement toward digital platforms and shared content with public TV and other like-minded partners, perhaps as part of the local civic agenda. I’m hoping for spectacular advances in this ring. A well-trained newsroom championing the needs of a local community can change the destiny of a place. One thing’s for sure: It’s no time to throw in the towel. A New York City subway train holds 1,200 people. This blog was viewed about 4,800 times in 2011. If it were a NYC subway train, it would take about 4 trips to carry that many people. MACON, Ga. — A new effort will increase and strengthen local reporting by bringing professional journalists to work together with university students in a unique, joint newsroom in Macon’s College Hill Corridor. The Center for Collaborative Journalism at Mercer University will bring the medical school model to the university’s journalism program. Professionals from The (Macon) Telegraph and Georgia Public Broadcasting (GPB Media) will work alongside Mercer students to learn and employ digital-age storytelling skills to meet Central Georgia’s information needs. In coming years, the joint newsroom also will launch community engagement projects that will involve Macon residents in choosing important issues to cover, reporting the facts, debating the choices facing them and ultimately creating solutions. In addition, GPB Macon Radio will expand its staff in Central Georgia over several years and greatly increase the station’s coverage of news, business, arts, sports and culture. The effort is being supported by $4.6 million in grants from the John S. and James L. Knight Foundation. Mercer, GPB Media, The Telegraph and Knight Foundation announced the project today at the site of the new center in Mercer Village. New Policy Paper Recommends Transformation of Public Media – Knight Foundation. The December 2010 whitepaper by Barbara Cochran, "Rethinking Public Media: More Local, More Inclusive, More Interactive"
This white paper provides a basis upon which to build our plans for local public media. 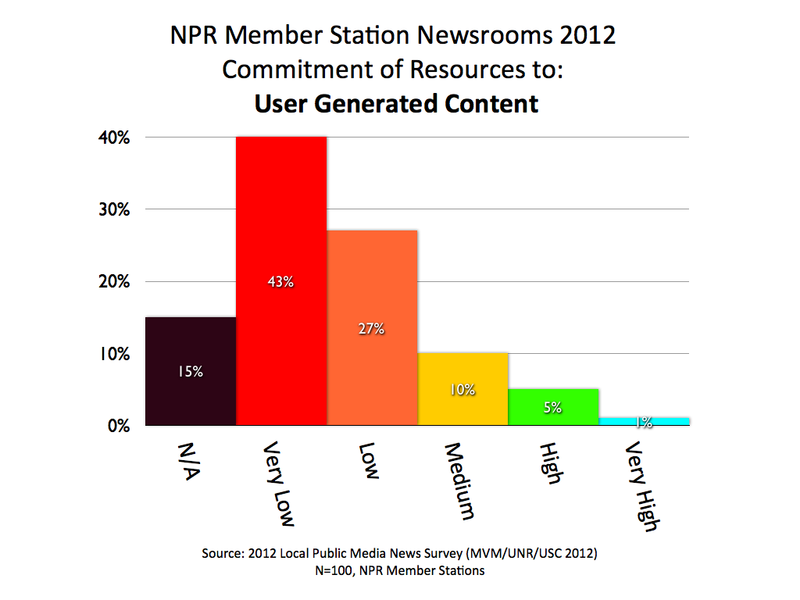 The mission of Local NPR is to share ideas, facts and stories that help U.S. public broadcast newsrooms transform themselves into significant multi-platform journalism institutions in their communities. It was started by Michael V. Marcotte in January 2011.